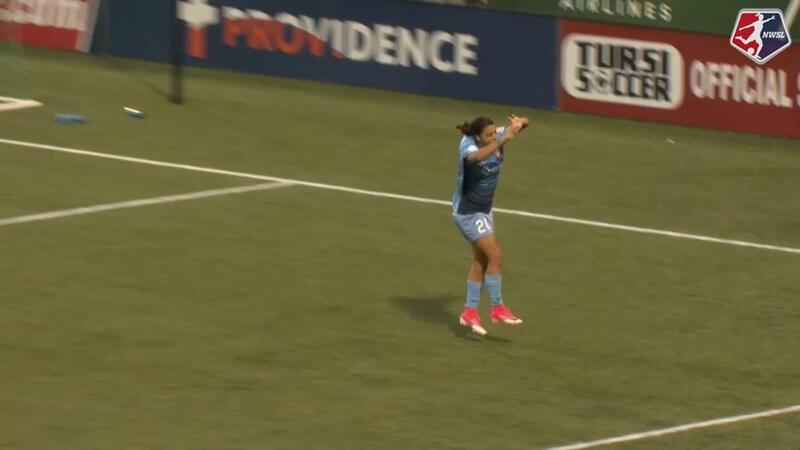 Sky Blue needed late-game heroics from Sam Kerr last week, but this week all they needed was a fifth minute goal from Kerr to win 1-0 at home over the Boston Breakers. The goal is Kerr’s 16th of the season, tying the NWSL record for goals in a single season set by former Reign FC midfielder Kim Little in 2014. The win moves Sky Blue FC (9-9-2, 29 points) up into 5th place, three points behind the Red Stars and Pride for the fourth and final playoff spot. With the loss, the Breakers (3-10-7, 16 points) are eliminated from playoff contention. Kerr scored her 15th goal of the season in the 94th minute last week, but it would not take her long to score No. 16 on Saturday night. 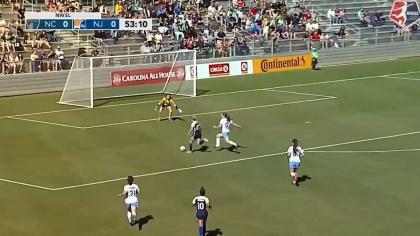 In just the fifth minute, Sky Blue FC midfielder Nikki Stanton sent a long ball over the top as Kerr made a run down the center of the field. Breakers goalkeeper Abby Smith came well out of the penalty box, but could not make a play, and Kerr was able to score into the open net for the record-tying goal. It’s just the second first-half goal of Kerr’s season as 14 of her goals have come after halftime, including all four in last week’s record-setting game. Kerr had several chances to get No. 17 in the game, but Smith would not allow another past her on the night, making seven saves in the match. She stopped Kerr on a point-blank header in the 24th minute. Then in the 62nd minute, Smith came off her line to shut down a Kerr run in the box. Kerr appeared to injure her ankle on the play, and briefly left the match, but returned. She had another shot at her second goal of the game in the 68th minute, but her effort went just wide. The Breakers nearly equalized in the 82nd minute. 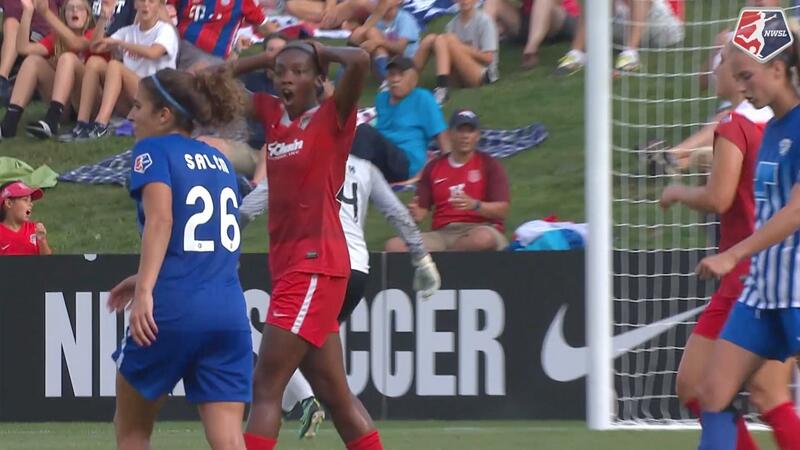 Defender Allysha Chapman sent a cross into the box that was punched away by Sky Blue FC goalkeeper Kailen Sheridan, but the clearance fell to Breakers midfielder Rosie White. White took a quick right-footed shot but it went over the crossbar. Stanton earned her fifth yellow of the season in the 57th minute and will be suspended for Sky Blue’s next game due to yellow card accumulation. Sky Blue defender Kelley O’Hara subbed into the match in the 59th minute, her first minutes with Sky Blue since returning from the Tournament of the Nations. She has been dealing with a right adductor strain. Breakers midfielder Rose Lavelle, who was upgraded to questionable on the injury report as she recovers from a strained left hamstring, was available off the bench, but did not see any minutes. Sky Blue will next face FC Kansas City on the road on Sunday. The Breakers pay a visit to Orlando to take on the Pride on Saturday. Foul by Margaret Purce (Boston Breakers). Attempt saved. Samantha Kerr (Sky Blue) header from the centre of the box is saved in the top left corner. Assisted by Maya Hayes with a headed pass. Corner, Boston Breakers. Conceded by Mandy Freeman. Attempt blocked. Ifeoma Onumonu (Boston Breakers) right footed shot from the centre of the box is blocked. Assisted by Rosie White. Attempt missed. Rosie White (Boston Breakers) header from the centre of the box is close, but misses to the right. Assisted by Allysha Chapman with a cross. Substitution, Sky Blue. Maya Hayes replaces Daphne Corboz. Attempt missed. Megan Oyster (Boston Breakers) right footed shot from outside the box misses to the right. Attempt missed. Rosie White (Boston Breakers) right footed shot from the centre of the box is just a bit too high. Attempt blocked. Margaret Purce (Boston Breakers) right footed shot from the left side of the box is blocked. Assisted by Rosie White. Substitution, Boston Breakers. Natasha Dowie replaces Katie Stengel. Attempt missed. Samantha Kerr (Sky Blue) left footed shot from the centre of the box misses to the right following a set piece situation. Nikki Stanton (Sky Blue) wins a free kick on the right wing. Attempt saved. Samantha Kerr (Sky Blue) right footed shot from the centre of the box is saved in the centre of the goal. Assisted by Sarah Killion. Adriana Leon (Boston Breakers) is shown the yellow card for a bad foul. Substitution, Sky Blue. Kelley O'Hara replaces Kayla Mills. Substitution, Boston Breakers. Morgan Andrews replaces Tiffany Weimer. Attempt saved. Madison Tiernan (Sky Blue) right footed shot from the left side of the box is saved in the centre of the goal. Assisted by Erica Skroski. Attempt missed. Adriana Leon (Boston Breakers) right footed shot from the right side of the six yard box is close, but misses to the right. Assisted by Margaret Purce. Attempt missed. Madison Tiernan (Sky Blue) header from the centre of the box is high and wide to the left. Assisted by Samantha Kerr with a cross. Attempt saved. Samantha Kerr (Sky Blue) left footed shot from outside the box is saved in the bottom right corner. Attempt blocked. Ifeoma Onumonu (Boston Breakers) right footed shot from the centre of the box is blocked. Assisted by Adriana Leon. Madison Tiernan (Sky Blue) wins a free kick on the left wing. Attempt missed. Samantha Kerr (Sky Blue) right footed shot from the right side of the box misses to the left. Assisted by Daphne Corboz. Offside, Sky Blue. Kayla Mills tries a through ball, but Samantha Kerr is caught offside. Foul by Tiffany Weimer (Boston Breakers). Attempt saved. Samantha Kerr (Sky Blue) header from the centre of the box is saved in the top left corner. Assisted by Daphne Corboz with a cross. Attempt blocked. Margaret Purce (Boston Breakers) left footed shot from outside the box is blocked. Assisted by Rosie White. Attempt saved. Adriana Leon (Boston Breakers) left footed shot from the right side of the box is saved in the centre of the goal. Assisted by Katie Stengel. Attempt saved. Katie Stengel (Boston Breakers) right footed shot from a difficult angle on the right is saved in the top right corner. Assisted by Rosie White. Dangerous play by Julie King (Boston Breakers). Attempt missed. Daphne Corboz (Sky Blue) right footed shot from the right side of the box misses to the left. Attempt saved. Madison Tiernan (Sky Blue) right footed shot from outside the box is saved in the bottom left corner. Assisted by Samantha Kerr. Attempt missed. Rosie White (Boston Breakers) right footed shot from outside the box is close, but misses to the right. Assisted by Adriana Leon. Goal! Sky Blue 1, Boston Breakers 0. Samantha Kerr (Sky Blue) right footed shot from the left side of the box to the bottom left corner. Assisted by Nikki Stanton with a through ball. Offside, Boston Breakers. Rosie White tries a through ball, but Katie Stengel is caught offside.